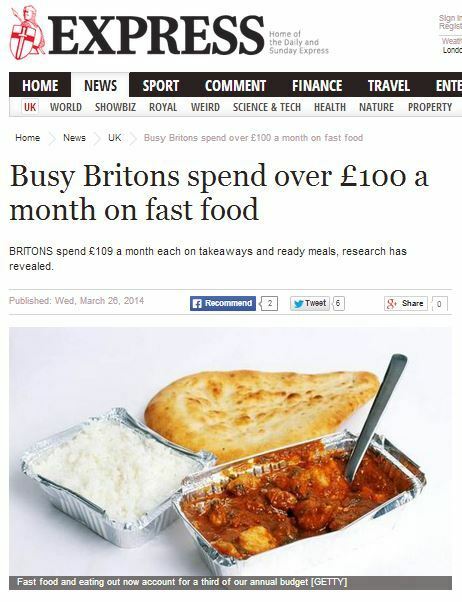 BRITONS spend £109 a month each on takeaways and ready meals, research has revealed. Fast food and eating out now account for a third of our annual food budget. We tuck into 12 convenience meals a month on average. Chinese is most popular, being the favourite of 26 per cent of those polled. 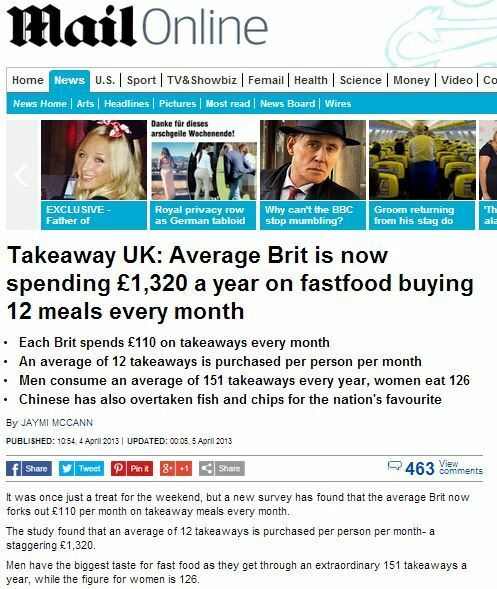 It was once just a treat for the weekend, but a new survey has found that the average Brit now forks out £110 per month on takeaway meals every month. The study found that an average of 12 takeaways is purchased per person per month- a staggering £1,320. Men have the biggest taste for fast food as they get through an extraordinary 151 takeaways a year, while the figure for women is 126. Fast food, despite its convenience, is no friend to our wallets – if this data is to be believed. Although that’s quite a big ‘if’, relying on the average person buying a £10 takeaway every three days. Could there be an ulterior motive behind this pair of stories making it to the press? Duncan Jennings, co-founder of vouchercodes.co.uk, said: ‘Takeaways are now a part of everyday life for busy consumers. ‘Britain has always been a nation of food lovers and especially as we have nearly every type of cuisine available on the go throughout Britain. Indeed, if the contents of this PR story for a discount voucher website were true, it really would be an expensive option… unless there was a voucher website on hand to help bring down those costs somewhat, of course. This entry was posted in VoucherCodes and tagged Anita Naik, daily express, daily mail, DUNCAN JENNINGS, jaymi mccann, vouchercodes.co.uk on June 4, 2014 by Michael Marshall. Christmas is supposed to a time for goodwill to all men but if the latest research is anything to go by, harmony won’t last long for two thirds of British families who say they won’t get through December 25th squabble-free. With the family gathered around to enjoy the big day, tempers are most likely to fray at 3.18pm – just one hour after Christmas dinner is served, according to one in six families. In fact, of those families who say a bit of bickering is on the cards, nearly half (45 per cent) will have rowed before they’ve polished off their Christmas pudding. Christmas is just around the corner, and with it the chance to appreciate those you love. However, not everything is rosy in the yuletide world, because that special time with your family can soon turn into a festive feud, if the latest research published in the Daily Mail is to be believed (come on, you know the drill by now). So, in actuality, which company is trying to grab your attention with a well-worn Christmas cliché, in order to sell to you? A spokesperson for Vouchercodes.co.uk, who commissioned the survey, said: ‘Christmas is one of the best times of the year to spend quality time with the family, but pulling it all together can be quite stressful at times. And what does a company specialising in distributing vouchers for online shopping have to gain from all this? ‘A good tip to ensure you stay as calm as possible is to simply plan ahead. Stay organised this Christmas and save time by doing your shopping online. You’ll not only avoid those stress-inducing long in-store queues, but save a lot of money too. Merry Christmas, from everyone at Vouchercodes.co.uk! This entry was posted in Christmas, VoucherCodes and tagged 10 yetis, bianca london, christmas, daily mail, vouchercodes.co.uk on December 22, 2013 by Michael Marshall. With less than four weeks until Christmas, thoughts are turning to shopping – and it seems that Brits are pulling out all the stops to get it done in time. New research reveals that 2013 is set to be the year of the ‘Santa Sickie’ with 1.8 million Brits admitting they’re planning to call in sick at work in order to do their Christmas shopping – costing the economy £161m. A fifth of Brits (22 per cent) now believe pulling a ‘Santa Sickie’ is acceptable if it means they can buy all of their gifts in time – that’s one million more people than in 2012. Anita Naik, a spokesperson for VoucherCodes.co.uk who commissioned the research, said: ‘It can sometimes seem impossible to fit in Christmas shopping on top of everything else that’s going on at this time of the year. ‘The good news is, even if you haven’t started your shopping yet, you still have plenty of time to buy from both in-store and online. If you do switch over to online shopping, remember to use your voucher codes to make those extra savings, of course. This entry was posted in VoucherCodes and tagged Anita Naik, bianca london, daily mail, vouchercodes.co.uk on December 15, 2013 by Michael Marshall. Parents who give in to nagging from their children spend an extra £2billion on things they don’t need every year. New research found the average child costs their parents 460 pounds by nagging them for goodies, which could range from sweets or junk food, to more unusual items such as cleaning products which have appeared in TV adverts. A whole host of strange items came up in the survey by VoucherCodes.co.uk, which asked 1,000 UK parents with children aged between 2 and 15 exactly what their kids pestered for. This entry was posted in VoucherCodes and tagged anita nak, daily mail, hayley o'keeffe, vouchercodes.co.uk on October 30, 2013 by Michael Marshall.